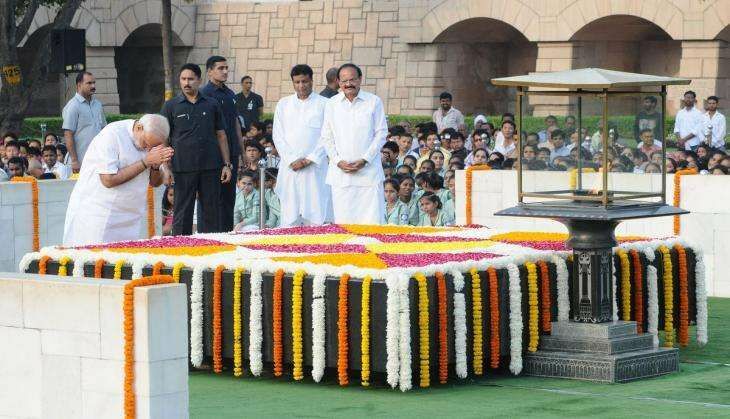 President Pranab Mukherjee, Prime Minister Narendra Modi and other leaders, on 2 October, paid tributes to Mahatma Gandhi on his 147 birth anniversary at his memorial in New Delhi. Vice President Hamid Ansari, former Prime Minister Manmohan Singh and senior BJP leader LK Advani also paid tributes to the Father of the Nation. "Gandhiji made this world a better place. His ideals, dedication to the poor & struggle against injustice inspire," the Prime Minister said in a tweet. Clad in a white kurta and pyjama, Modi, who arrived at 7:40 AM, paid homage to the Mahatma by offering rose petals at his memorial and performing a 'parikrama' (circumambulation) around it. Union Ministers M Venkaiah Naidu, Rao Inderjit Singh and Congress leader Ghulam Nabi Azad too joined in paying homage to the Father of the Nation. Delhi Chief Minister Arvind Kejriwal, who arrived along with his deputy Manish Sisodia, also paid tributes to the Mahatma on his birth anniversary. Ambassadors of several countries and other dignitaries attended the function. A large number of school children had also gathered at the venue to pay homage. An all-faith prayer meeting was held on the occasion.